Did you know that you are a “telemedicine provider”? No? I can’t blame you for not knowing, but you are, and always have been. Well, maybe not always, but certainly since Alexander Graham Bell invented the telephone. Better yet, you provide free telemedicine services. Here is an idea: on the home page of your practice website, you should add a big huge flashing banner saying “Free Telemedicine Services!” Still hesitating because you are not using fancy monitors when you take calls from patients? First, telemedicine does not necessarily imply multimedia, but if you want to be sure, just turn on FaceTime on your iPhone and ask your patient to do the same. Much better… Look at you now, providing the latest and greatest telemedicine service like a pro, for free. But wait a minute; didn’t the largest private insurer in the country just announce that it will begin paying for telemedicine services? Yes and no. UnitedHealthcare will pay for telemedicine encounters provided through a handful of telemedicine companies that are privately owned and venture capital backed corporations. UnitedHealthcare will be paying you squat for taking calls from your own patients, even if you do it on your spiffy iPhone 6, and even if you turn FaceTime on. However, if you sign up with Doctor On Demand, or American Well, to provide clinical advice on the iPhone to complete strangers, and fork over a portion of the proceeds to the corporation, UnitedHealthcare will pay you as well. This may be the most wonderful incentive for physicians to toss any remaining continuity of care considerations out the window. After all, why should you spend all your days seeing one distraught patient after another, with or without “good” insurance, who may show up or may not, and who may pay you for your service or may not, when you can just sit in your office, and shoot the breeze with perfectly healthy people, each getting precisely 15 minutes face time, after they swipe their credit card to ensure that you get paid for every second of that time? Perhaps it would be wise for you to cut your regular panel down, get rid of those patients who trouble you the most, let the others see your assistant, and practice in-person medicine as a hobby, to keep your skills up and to add a little variety to your new electronic career. In its announcement UnitedHealthcare cites the mythical 45,000 physician shortage, particularly in rural areas, as the impetus for providing telemedicine services to its members. Having board certified and experienced physicians cater to a constant stream of colds, sinus infections, allergies and tummy aches, all of which are recommended to be delegated to non-physicians working at the “top of their license” in traditional practice, is somehow supposed to alleviate this shortage. Providing a means for urban and out of state physicians to compete with country docs, for credit-card carrying worried-well, is envisioned to improve the disparities in access to quality medical care in rural America. That may soon be a moot question though, because the “promise of telemedicine” is being fulfilled as we speak. First Opinion, a venture-capital backed company, is taking telemedicine to where no doctor has gone before. First Opinion is bringing back the “intimacy” of “meaningful relationships” to health care by deploying an offshore cadre of exclusively female “certified doctors” who will respond to your text messages as often as you wish, day or night, free of charge. You must solemnly swear that “you will not attempt to learn the identities and/or locations of the “Drs.””, who may or may not be “who they claim to be”, and of course First Opinion is taking absolutely no responsibility for “the quality, reliability, timing, legality, integrity, authenticity, accuracy, appropriateness” of its strictly non-medical telemedicine. If this particular flavor of telesnakeoil sounds like a petty aberration that will most certainly be shut down, you need to know that this particular business model is the spitting image of the decades old disruptive innovations that swept other science, technology, engineering and math (STEM) fields. It starts with the fabrication and propagation of stories about shortages of qualified workers and how high wages are bankrupting the industry. It then proceeds to the offshoring of and the importation of temporary foreign workers for “low skilled” functions that Americans supposedly have no interest in performing (think primary care). Before you know it, the President is bemoaning the STEM shortages in the State of the Union, and global corporations are forcing the passage of legislation to encourage a steady supply of cheap STEM labor. In the meantime, STEM wages are stagnating and most STEM graduates are forced to look for jobs in other fields. The S in STEM stands for science. Physicians are STEM workers. And the billionaire funded Partnership for a New American Economy, which is aggressively campaigning for increased temporary worker visas, has physicians and nurses squarely in its crosshairs. Sending medical work overseas and importing cheap physician labor from developed countries is not going to be as easy as it was in the tech industry, not because our doctors are the best of the best (our engineers used to be the best too – quality is not the point here), but because of existing regulatory hurdles tying the practice of medicine to a geographical area which is smaller than planet Earth. Once State by State medical licensure requirements are removed with active support from shortsighted physician organizations, the (oh, so expensive) residency requirement will be next on the chopping block, and the transformation will be complete. In a last ditch effort to stem the tide of physician nullification, the Texas Medical Board (TMB) is trying to put a modest stake in the ground by ruling that physicians can only provide telemedicine services to patients with whom they have a preexisting in-person relationship, or if another clinician is present at the patient’s location. This rule permits basically all modalities of useful telemedicine services, except the “one-and-done” type of remote encounter, where a minor ailment is diagnosed based on hearsay and, most importantly, antibiotics are diligently prescribed. I did not see any massive support for the TMB from physician organizations. Instead the TMB was slapped with a lawsuit from Teladoc, a telemedicine service provider, getting ready to go public and arguing that by enforcing a standard of care, the medical board is interfering with Teladoc’s God-given right to make lots of money. Telemedicine, you see, is the greatest innovation since sliced bread, and it is going to do for America’s health exactly what its predecessor did. You don’t need to be a “futurist” to see where this is going. The TMB will most likely lose its case in courts stacked with corporate lackeys. Next, the unregulated interstate commerce in telemedicine will further accelerate the exodus of physicians (and hospitals) from rural and working-class areas, which is a good thing for telemedicine vendors. Finally, the best paid middle class profession will be “globalized” to places where “doctors” work for less than American minimum wages, and we will all be conditioned to crave and consume deadly amounts of convenient and nearly free iPhone medicine. You may be tempted to blame the public for its quest for cheapness and convenience, or for its inability to value a relationship with a trusted physician. You may be increasingly frustrated by the starstruck media and its unquestioning worship of all things originating from Silicon Valley, and you may be disheartened by corrupt government acting on behalf of billionaire thugs to swindle the populace. But where are our doctors? Not the offshore avatars, and not the ones submitting themselves to $40 peepshow sessions, but the overwhelming majority of American physicians, still anchored in their communities and still practicing ethical medicine, one patient at a time. Where are you guys? On April 16, 2015, President Obama signed into law H.R. 2, the Medicare Access and CHIP Reauthorization Act of 2015 (MACRA), effectively sentencing Fee for Service (FFS) to death. The best explanation for how FFS is destroying the nation comes from Charles Munger, vice-chairman of Berkshire Hathaway and ad-hoc health luminary, who is equating what American doctors do, to raising rattlesnakes so they can collect the bounty for dead rattlers offered by the government in an effort to combat a growing snake problem. Based on this, and other equally compelling insights, FFS was found responsible for willful destruction of our great nation. A few months before Congress delivered its coup de grâce to the FFS system, the Secretary of Health and Human Services, explained to the elite group of NEJM paying customers, how “30% of Medicare payments should be tied to quality or value through alternative payment models by 2016 (50% by 2018)”. Other than transforming traditional Medicare into a vintage 1990s HMO, the Secretary intends to make sure that “the same new alternative payment models and payment reforms are broadly adopted by a critical mass of payers”, effectively transitioning the entire country into managed care. Just like that. The first MACRA option for physicians to get their little Medicare bonuses is to participate in an alternative payment model (APM), where doctors behave like miniature insurance companies, and provide care based on sound actuarial principles. Somewhere, somehow, someone figured out that fragmenting insurance pools into tiny groups of insureds provides better “value to consumers” than having large and diverse insurance pools. The same architects of health care improvement, decided that having each accountable care organization (ACO) purchase, implement and manage separate instances of hugely sophisticated and very expensive actuarial (a.k.a. analytics or population management) software is another great way to add “value to consumers”. In summary, it seems that APMs are well positioned to change absolutely nothing, with the possible exceptions of increased prices for medical services due to consolidation and the massive burnout of doctors, while providing a steady source of government and health plan “incentives” to pay for more computers and more administrators. A brand new study of 32 Pioneer ACOs, published this month in NEJM, calculates that on average the ACOs generated 1.2% savings, approximately $120 per member per year, in 2012, with no substantial changes to “quality” as measured by mammography screenings and lab testing frequency. Another, even newer study of the same 32 Pioneer ACOs, paid for by CMS and published in JAMA, found that the same 32 Pioneer ACOs generated approximately $427 per member per year savings, in 2012, with slight improvements in patients perception of their experience. The JAMA study looked at 2013 as well, and found a sharp drop in savings to just $135 per member per year. Both studies acknowledge two glaring limitations. First, Pioneer ACOs were handpicked by CMS to be those organizations most likely to be successful from the get go. Second, these savings, or rather differentials in growth of expenditures, do not account for costs to set up and run an ACO. The more flattering JAMA study estimates $385 million in savings over the two years period for 32 Pioneer ACOs. This translates into an average $6 million savings per ACO per year. A separate report from the National Association of ACOs, estimates ACO costs in year one, ranging from $300,000 for a small ACO up to $6,700,000 for larger ones. The Pioneer ACOs in the JAMA study were rather large, with over 20,000 lives per ACO on average. Note that these costs do not include the costs to Medicare to run and administer the ACO programs. Put it all together, and this is starting to look more like robbing patients and doctors to pay for, you guessed it, more computers and more administrators. The second option to get your MACRA incentives is the Merit-Based Incentive Payment System (MIPS). The structure of the MIPS is a monumental tour de force in micro management, petty vindictiveness and accounting, that combines all current Medicare initiatives (i.e. PQRS, value-based payment modifiers, meaningful use, and practice improvements) into one monster program designed to push all doctors into risk assuming APMs. If you are a glutton for punishment, you can read the English language translation, provided by the Ways and Means Committee. The only certainty here is that implementing this temporary payment scheme is going to cost taxpayers, directly and mostly indirectly, more than the amount of incentives slated for payment to physicians, with practically all additional expenditures to flow, yet again, to more computers and more administrators. Whereas paying doctors a fixed fee for each service is considered an unholy abomination, paying Walgreens, Walmart, CVS, Teladoc, American Well, and the like, a fixed fee for each service is considered a Culture of Health. In a new and groundbreaking report sponsored and published by the esteemed Robert Wood Johnson Foundation (RWJF), a bunch of business consultants are making recommendations to the big box retail clinics industry on how to enhance their value proposition and “become a much more powerful enabler of a Culture of Health”. Recommendations range from steadily increasing complexity of services provided by non-physicians in retail settings, to include chronic care management, and health care for children (casually dismissing recommendations from the American Academy of Pediatrics), to bundling and upselling “health” foods to patients. Since telehealth is hotter than molten lava nowadays, the report includes analysis of the incredible cheapness of telehealth services “at retail clinics and beyond”. Before proceeding to recommendations about lobbying state legislators and public payers to allow and pay for unfettered access to telehealth services, the RWJF report is informing us that “the most common diagnoses made during telehealth visits are sinusitis, cold, flu, pertussis, and urinary tract infections—conditions also frequently treated at retail clinics”[emphasis added]. This bit was copied and pasted from an equally insightful marketing piece for the telehealth industry written by an expert actuary. It took major effort to restrain my urge to call the White House and ask the President to declare a national state of emergency and shut down every port of entry into the continental United States. 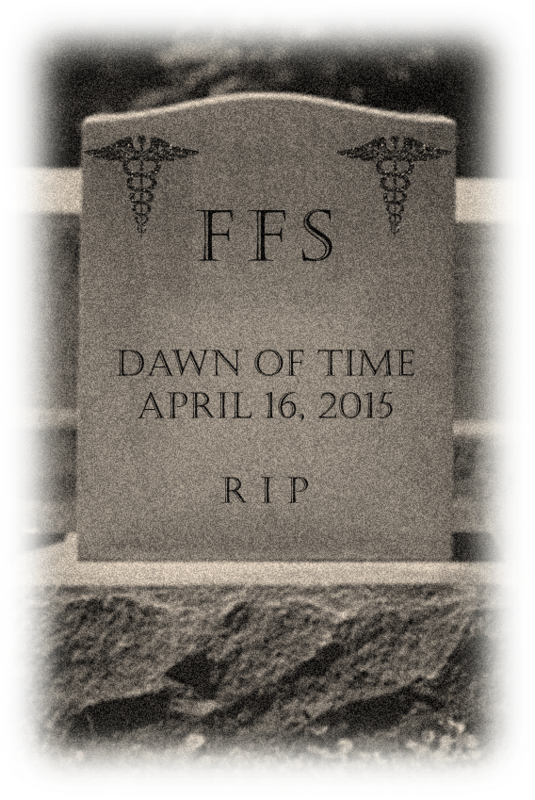 One would hope that the decision to eliminate FFS for doctors was based on something other than rattlesnake fables and whooping cough pandemics. One would also hope that decision makers observed and learned from, or at the very least considered, health systems of other wealthy nations that are supposedly better and cheaper. One would be wrong. According to the latest Commonwealth Fund international report on health care systems, it seems that many of those enlightened and cheap nations pay doctors mostly with FFS, some exclusively so, especially Germany, the economic powerhouse of the European Union. For some reason FFS seems to have no devilish toxic effects outside the international borders of the United States. You may be tempted to blame the misunderstanding on clueless bureaucrats, accountants and bean counters who don’t understand patient care. You would be wrong again. Bureaucrats understand numbers. They understand financial and operational charts and tables, better than doctors do. The reason FFS is being killed off in America is not so we can achieve better results at lower costs as other developed countries have consistently done. FFS for physicians, and only for physicians, is being eliminated so we can roll out the cheapest possible substitute to medical care, and frankly dear doctor, with all due respect, you're in the way.